Since Lloyd Alexander’s books were what started the conversation, I thought it was only fair to start the project with him. 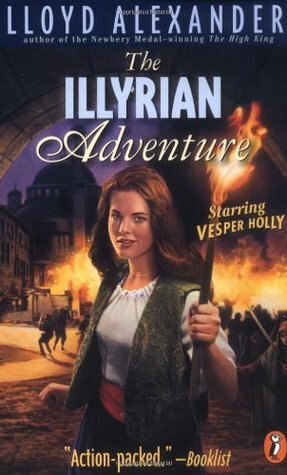 As a kid, I was aware that he had written other series (I remember seeing the Vesper Holly books sitting on the library shelf when I checked out The Castle of Llyr for the fourth time), but I never branched out into them, because I was pretty sure that nothing could be as good as the Prydain books. Going into this, the Vesper Holly series seemed like the best jumping-off point. A quick summary: the series centers around the adventures of Vesper Holly, a teenage orphan in the late 19th century (the first book starts in 1872) being raised by her father’s friend and former partner in adventuring, Professor Brinton Garrett (called “Brinnie” by Vesper). More adventuring ensues, causing Vesper to be described on book jackets as a hybrid of Sherlock Holmes and Indiana Jones (I do love that the above cover goes full-out with the Indy imagery, especially since my copy has a hand-drawn 1970’s nightmare instead). To be honest, there’s not much of Sherlock to Vesper Holly, and I was all prepared to write that she seems to have been influenced more by Lara Croft, but some quick Wikipedia work reveals that Vesper Holly actually predates Lara Croft by a decade – The Illyrian Adventure was published in 1986, and Lara Croft did not grace our screens until 1996. I think Lloyd Alexander’s estate is owed some royalties. Anyway, the book opens right after the death of Vesper’s father, when Brinnie is meeting his new ward (Brinnie narrates all the books, and I suppose this is okay because it’s a Conan Doyle homage, but it was still disappointing that our heroine doesn’t get to tell her own story). It doesn’t take too long before Vesper has convinced Brinnie that they need to travel to Illyria (not a real country, but it’s basically a Greece/Turkey hybrid) to finish investigating some ruins that her father was researching. Illyria is in a state of unrest – there’s a lot of backstory about how the country was invaded by the Zentans a long time ago and now the two ethnic groups are constantly clashing – and this means lots of swashbuckling adventuring and some vaguely-uncomfortable scenes of Vesper smashing her way into the local customs and sacred monuments with all the tact and self-assurance of the finest 19th-century white colonizer. As college professors are fond of saying, let’s unpack that. Vesper Holly is sixteen years old, and based on what we see of her in this book, can do anything. And I really mean anything. She becomes fluent in Illyrian in a matter of days, easily beats a rebel leader in chess, and is an expert archaeologist who solves centuries-old mysteries that stumped all other researchers. Here’s the simple fact: it is impossible for Vesper to be as knowledgeable as she’s presented in the books, for no other reason than she, as sixteen-year-old, has not had the time to devote to these numerous fields of study. It requires a very large leap of faith for the reader to believe that our heroine is as smart as the plot requires her to be, and in a novel for adults, this leap would not be possible. But here’s the thing: this is not a book for adults. This is book aimed at the eight-to-twelve age group, and there is a big difference between what adults need their heroes to be and what children need their heroes to be. Adults demand heroes who are flawed and fallible, who make mistakes, and who probably have some kind of dark past that they hide with excessive sarcasm or alcohol or a bat costume. Kids don’t want heroes who can’t do certain things, because that’s what being a kid means – there are things you don’t know and can’t do, and adults don’t take you seriously, all because you’re a kid, and it’s not fair. In this way, Vesper Holly is the ideal heroine for children: she knows everything, more than most of the adults around her; she has no parents to prevent her from going on any adventure she wants (it should also be pointed out that, like her predecessor Nancy Drew, Vesper is rich and apparently does not attend school, leaving her free to jet off wherever she wants whenever she wants); she is brave, to the point where being stabbed by a stranger during a riot prompts her to observe calmly that the knife “felt like something stung me”; and most importantly, everyone around her treats her with respect. Vesper Holly is a classic children’s hero – a girl who is treated like an adult without having to actually be an adult, therefore occupying the best of two worlds. The book is not without its issues, of course, and I’ll have to wait to discuss them in more detail when I review the second book in the series, which suffered from many of the same problems. The point I want to bring across in this review is this: Vesper Holly is a fascinating character, one who deserves much more recognition than she’s received so far, and the flaws in her stories shouldn’t diminish this. I just wish I hadn’t waited so long to seek out her books.